NMA trainer Adam Ensalaco specializes in making rent calculation easier to understand and clearing up common misconceptions about the process. 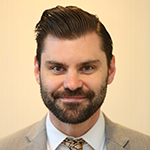 Adam has previous experience in the affordable housing industry working to house people with disabilities and training housing authorities on reasonable accommodations and has been a part of the NMA team for nearly a decade. Next month is Fair Housing Month! In honor of this occasion, I’m sharing four tips I’ve learned over the years. 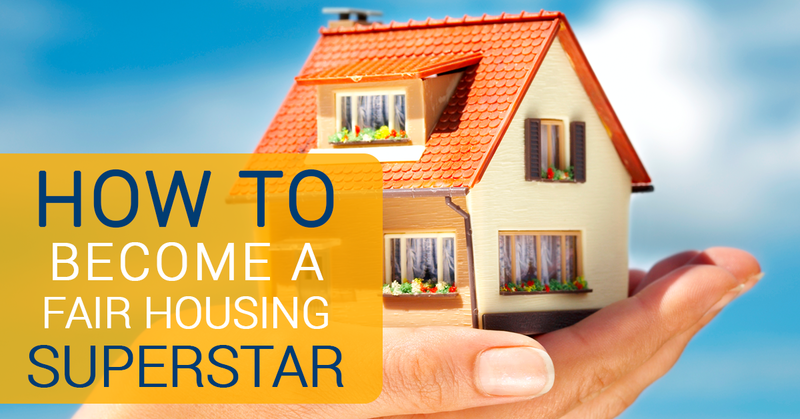 From “senior buildings” and reasonable accommodation to service animals and housing terminology, I’m here to get you on the path to becoming the fair housing superstar I know you are. This is a four part series, so be sure to read parts one, two, and three. Within our offices, it’s very common for us to create our own jargon. I have heard the HUD 52517 form, which is officially entitled “Request for Tenancy Approval” called “The Rafta,” “The R.F.T.A.,” and “The Moving Papers” at various housing authorities (and once by three different staff members of the same housing authority). Similarly, I have often heard, “we have a participant requesting an assistance pet” or “we issued them a moving voucher.” And as I mentioned above, I hear the phrase, “this is a senior development” quite often. But these are not HUD terms in the HCV or public housing regulations. If we were to try to find the regulations governing “senior developments” or “senior buildings,” we wouldn’t find anything. These are not HUD terms, so I often find myself having to take the time to go back, unravel the confusion, and clarify issues before I can get to actually answering the question at hand. This lack of clarity with our language can have very detrimental effects when we try to research areas where we require guidance on how to assist our clients. Make sure your staff is on the same page with HUD. On the occasions when you need to reach out to your field office for help, choosing your terms carefully can prevent confusion and miscommunication. Everyone here at NMA understands that these fair housing rules can seem overwhelming and confusing. But the good news is that we're here to help! I hope this has been an enjoyable (or at least helpful) read, and I speak for all of us here when I say we look forward to coming to your PHA to help guide you through some gray areas in the months and years to come. Want to build up your fair housing knowledge? Adam Ensalaco specializes in making rent calculation easier to understand and clearing up common misconceptions about the process. Adam has previous experience in the affordable housing industry working to house people with disabilities and training housing authorities on reasonable accommodations and has been a part of the NMA team for nearly a decade. Next month is Fair Housing Month! In honor of this occasion, I’m sharing four tips I’ve learned over the years. 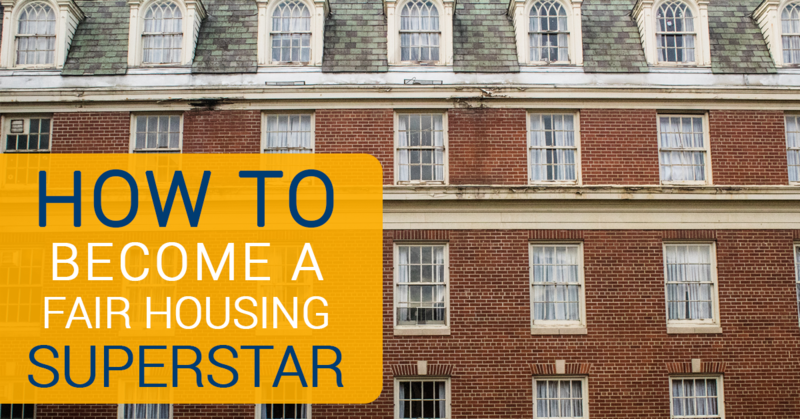 From “senior buildings” and reasonable accommodation to service animals and housing terminology, I’m here to get you on the path to becoming the fair housing superstar I know you are. This is a four part series, so be on the lookout for part four coming out next week! There are three legally distinct types of animals in public housing. Service animals are dogs or miniature horses that have been trained to do something specifically related to a disability. Examples include a guide dog (or guide horse) for a client with vision impairment, a seizure alert dog, or a dog trained to bring various items (shoes, medicine, remote control) to a client with disabilities. PHAs may only ask if the dog is needed for a disability and what it has been trained to do. However, if it’s clearly obvious to the PHA (i.e. a guide dog for a client you can tell or already know to have a vision impairment) then no questions should be asked. PHAs may not ask what the disability is, how extreme it is, proof that the dog can do it, proof that it has been trained or licensed. Note that service animals are not reasonable accommodations. The same four-step process outlined above does not apply here (see the Americans With Disabilities Act for more guidance). An assistance animal is not a pet. It is an animal that works, provides assistance, or performs tasks for the benefit of a person with a disability, or provides emotional support that alleviates one or more identified symptoms or effects of a person's disability. Assistance animals perform many disability-related functions, including but not limited to, guiding individuals who are blind or have low vision, alerting individuals who are deaf or hard of hearing to sounds, providing protection or rescue assistance, pulling a wheelchair, fetching items, alerting persons to impending seizures, or providing emotional support to persons with disabilities who have a disability-related need for such support. For purposes of reasonable accommodation requests, neither the FHAct nor Section 504 requires an assistance animal to be individually trained or certified. While dogs are the most common type of assistance animal, other animals can also be assistance animals. Neither service animals nor assistance animals are pets, and neither of them are subject to the regulatory restrictions under 24 CFR Part 960 Subpart G and Part 5 Subpart C.
24 CFR 960 Subpart G and Part 5 Subpart C cover pet ownership in public housing. As PHAs that own public housing are landlords in their jurisdictions, HUD intends for them to follow all the state or local laws and ordinances that govern pet ownership in their area. This includes establishing pet fees, inoculation requirements, limitations on the number and size of animals per square foot of living space, etc. From a fair housing perspective, what’s most important to remember is that service animals and assistance animals are not pets. Next month is Fair Housing Month! In honor of this occasion, I’m sharing four tips I’ve learned over the years. 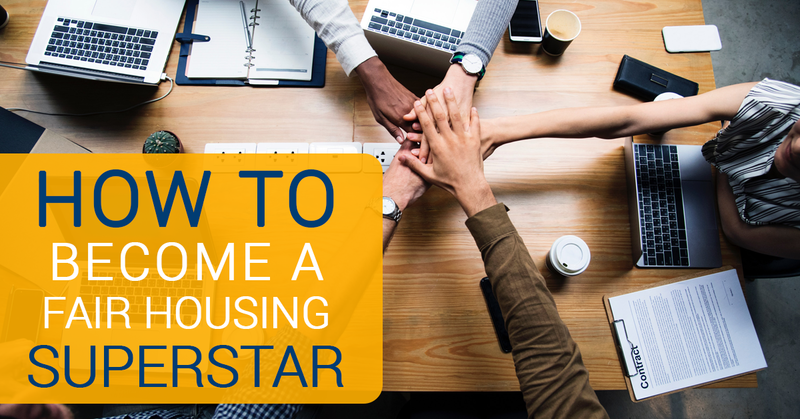 From “senior buildings” and reasonable accommodation to service animals and housing terminology, I’m here to get you on the path to becoming the fair housing superstar I know you are. This is a four part series, so be on the lookout for part three coming out next week! The reasonable accommodation process can be a major thorn in the side of PHA staff if they do not understand the nuances of the guidance. Confusion often leads to frustration often leads to fatalism. Not being discerning enough can lead to fraud and OIG audits, being too overly skeptical can lead to lawsuits and charges of discrimination. More than 50% of discrimination complaints to HUD are based on disability-based discrimination. There are four steps to any reasonable accommodation. They don’t always involve your client walking into your office and declaring, "I hearby request that you accommodate me!" Often, it’s something much more like, “I know I already got one extension on my voucher, but I need more time.” If your policy is only one extension, then your response should be something like, “well our policy is one extension only, unless a disability is making your housing search more difficult.” Or maybe the client says, “when I moved into that second-floor walk-up unit, it was no problem, but my arthritis is acting up and getting up and down those stairs is really difficult now. Is there any way I can move to a first-floor unit?” You may have a reasonable accommodation request form for the client so that you can keep your files well-documented but remember that you cannot hold up the process just because they refuse to complete the form. Once a request is made—even just verbally—it has been made and the PHA must act upon it (this is addressed in the Q&A section of the HOD/DOJ Joint Statement on Reasonable Accommodations). The “nexus” is the connection between the disability and the request. What turns this want into a need? Everyone in the world wants an extra bedroom. But why does this client need more space than they currently have? We also need to recognize that sometimes multiple nexuses can overlap. Sometimes a client needs a live-in aide and also needs to use their voucher or find a public housing unit in a particular neighborhood close to their doctor or family members who assist them. A reasonable accommodation request may only be denied if it would impose an undue financial and administrative burden on the housing provider or fundamentally alter the nature of the provider’s operations. It is critical to note that this language was absent from the previous notice on reasonable accommodations, PIH 2010-51. The only difference from 2010-51 to 2014-25 was to include the sentence I have quoted here. It seems that HUD wanted to make this point very clear. Example: Three months after moving into a second-floor walk-up unit, your client requests to move to a first-floor unit because they are having difficulty navigating the stairs. The nexus is clear but beginning the moving process this quickly after getting a client leased-up is certainly more work than you were expecting to do that day, but it’s still standard PHA fare. So it’s an administrative burden, but not an undue one. In this example, the PHA would grant this request. Students often comment, “but if I say yes to this, I know that thirty people will come in tomorrow asking for the exact same thing.” Possible exaggeration aside, yes: word can certainly spread, especially in public housing where your clients are neighbors. Nevertheless, a reasonable accommodation cannot be denied simply because saying yes could open the floodgates. You are approving or denying this request on its merits alone. It is also important, though to remember that no regulation can force you to conjure resources you don’t have out of thin air. If there are no vacant accessible units in your public housing program, then all you can do is place them on your transfer list and keep them posted. You can issue a voucher, you can grant extensions, but you likely don’t have the funds to renovate a private unit to make it fully accessible. Reasonable accommodation: It’s not a rubber stamp, it’s not a blank check, but if everyone did it right there would be more yeses than there currently are. Next month is Fair Housing Month! In honor of this occasion, I’m sharing four tips I’ve learned over the years. 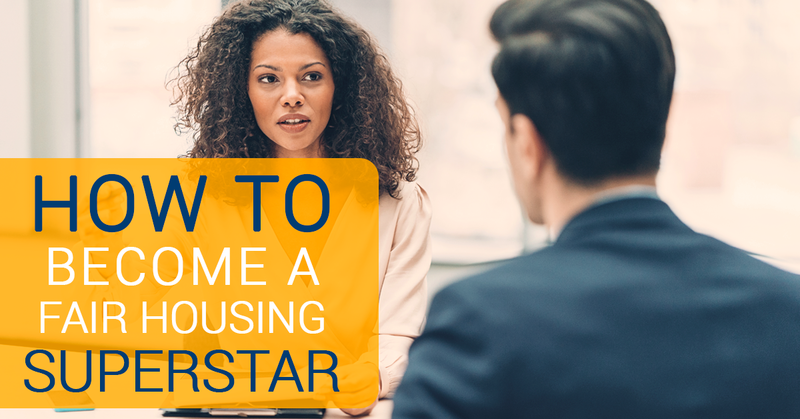 From “senior buildings” and reasonable accommodation to service animals and housing terminology, I’m here to get you on the path to becoming the fair housing superstar I know you are. This is a four part series, so be on the lookout for part two coming out next week! In the public housing program, there are four types of developments. These developments are reserved for families where the head, spouse or cohead are either elderly (62 and up), or who have a HUD-defined disability. These developments are reserved for families where the head, spouse, or co-head has a HUD-defined disability. These developments are reserved for families where the head, spouse, or co-head is elderly. Elderly family means a family whose head, spouse, or sole member is an elderly person. The term “elderly family” includes an elderly person, two or more elderly persons living together, and one or more elderly persons living with one or more persons who are determined to be essential to the care or well-being of the elderly person or persons. An elderly family may include elderly persons with disabilities and other family members who are not elderly (emphasis mine). This makes it clear that there are no public housing buildings which can legally exclude children. There are many reasons why this confusion occurs. First, many of these mixed population or designated elderly developments contain only studio or one-bedroom units. It can seem odd to public housing staff to allow an elderly head of household to share a one-bedroom unit with a minor child. But the Fair Housing Act prohibits familial status discrimination. This means that a PHA cannot treat families with children differently than families without them. If you would let an elderly couple share a one-bedroom, you must allow an elderly head of household to share a one-bedroom with a minor child as well. It is also possible that no non-elderly person has ever tried to reside in that development. The community at large, the PHA staff, and the residents have all always just assumed that the development is for "seniors only." It is very common in class for PH staff to refer to these as "senior developments" although that is not a HUD term (more about this linguistic confusion later). Lastly, many PHA staff, both in property and program management, began their careers in the private housing market, where senior-only housing is legal. And it’s not always immediately clear just how different HUD-funded housing is from private market housing. What is critically important to understand, however, is that any families on the public housing waitlist who have a head, spouse, or cohead that is elderly must be considered an "elderly family" regardless of any minor children who may also be listed on the application. Failure to offer a unit in a mixed population or designated elderly development to such a family simply because of the presence of minors would be a violation of the Fair Housing Act and a contradiction of 24 CFR 945.105. Finally, all specially designated developments (mixed population, designated elderly, and designated disabled) must be included in a PHA’s annual contributions contract.